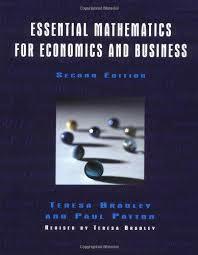 245 1 0 %a Essential mathematics for economics and business / %c Teresa Bradley, Paul Patton. 250 %a 2nd ed. / %b revised by Teresa Bradley. 260 %a New York : %b John Wiley & Sons, %c 2006. 300 %a XVII, 637 s. : %b il. ; %c 24 cm.